Pre-heat oven to 375 F (190 C). You will need a 9-inch disposable aluminum or Pyrex glass pan . For Dough: Combine flour, salt, sugar, butter pieces and shortening. Mix on low (stir) until the butter lumps resemble coarse meal. Wrap in saran wrap and chill for at least 30 minutes. Mix brown sugar with the white, 2 tablespoons flour, cinnamon, nutmeg, and lemon zest. Divide into 2 parts, reserving 1 part. Peel, core and slice the apples. Try to keep the size of the slices even. Sprinkle the apples with half of the sugar mixture. Let stand. With Dough: Divide the dough into two pieces one a little bigger than the other. Save the smallest piece to the top of the pie. Roll out the larger disks on a lightly floured surface until you have a circle that's about 12 inches in diameter. 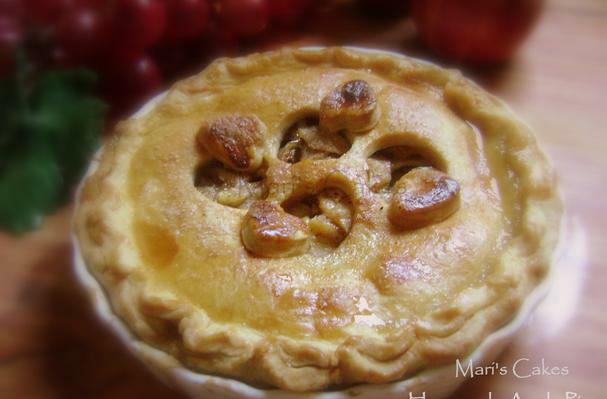 Put the circle in a pie plate, trimming any extra dough from the edges with a sharp knife leaving 1/2 inch extension. Sprinkle remaining sugar on bottom of covered plate and reserved a little to sprinkle on top of filling. Place the apples, sprinkle some sugar and dot with 3 tablespoons butter or margarine. Cover with top crust and seal the edges. Cut slits in the top for steam to escape. Bake 50 - 60 minutes or until crust is brown and juice begins to bubble through slits in crust. Cool 30 minutes. Ideal to served warm but it is delicious cold too! You can serve with whip cream or vanilla ice cream. Enjoy!